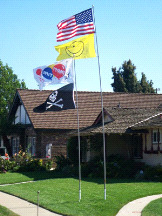 22' Heavy Duty Fiberglass Telescoping Flag Pole w/ BUMPER MOUNT, Silver Ball Finale & American Flag. (Flagpole Pictured on Right). After 4 years we have "Raised the Bar" with what has already become an instant hit. We designed this rigid fiberglass flag pole to handle the most demanding winds found in the desert and sea side locations. The top section is approximately 1” in diameter and the bottom section is just less than 2” in diameter. It was designed to fit snuggly into all our 22' Series Mounts without the need for rubber spacers or protective sleeves to make it fit correctly. This shiny metallic grey pole collapses down from 22 Feet to 50 inches for easy storage in your RV. Not only is it easy to store, it only weighs 4 Pounds. 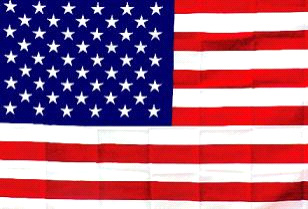 If you have any questions regarding this flag pole please give us a call (800)355-2956. Fits on any 4 inch rear bumper. 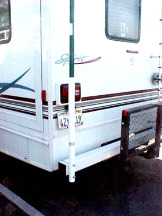 Designed for the 22’ heavy-duty fiberglass flag pole. Can also be used on the front of a pull trailer with a 4” channel frame. Made in USA. 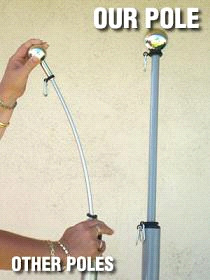 This mount has recently been strengthened 50% to handle the most demanding winds when using our 22' flagpole. These 3'x5' flags are made from polyester for the outdoors. Comes complete with eye holes for hanging and is light weight for those insane dune winds.